Montserrat villa, situated on the cliffs just 40 feet above the ocean. 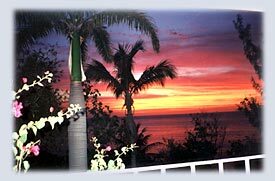 Our Spanish style two bedroom villa is located near Lime Kiln Bay, in Olveston, Montserrat, West Indies. Our villa offers a private setting with magnificent views of the coastline, mountains covered with tropical foliage, and the islands of Nevis and Redonda. You'll enjoy spectacular sunsets on the ocean from the very private pool, covered patio, or the perfect hammocks at the oceans edge. The 2 acre property is landscaped with lush tropical terraced gardens that include citrus trees, mango, coconut palms, bananas, hibiscus, crotons, aloe and numerous other flowering plants. It's a short walk to Lime Kiln Beach, which you will have to yourself most of the time. Woodlands Beach and others are a 10-minute drive away. Restaurants and groceries are within a short drive, or take a 20 minute drive to the "north" for more shopping and dining choices. Montserrat's new airport is also located in the north, and the short 15 minute flight from Antigua can be booked with either FlyMontserrat or SVG Air. Our location at the end of the road, perched on the cliff, offers the privacy, peace and quiet, and overwhelming views to make your vacation holiday the best. It's the perfect get-away place to relax and unwind. If you're looking for a quiet, private, beautiful island get-away, where the people are friendly, the temperatures are perfect, the water is pure and delicious, and you're out of the mainstream and crowds of tourists, then Tan Ry Doon is for you!